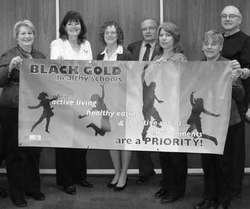 A new banner will be displayed in Black Gold Schools to promote healthy eating, active living and positive social environments, which are the priority areas for the division. Cheryl Hafso, New Sarepta Elementary principal, involved with Black Gold Healthy Schools (BGHS) presented the banner to Black Gold Regional School trustees at the March Board meeting. “Each school will have the banner in their school to celebrate all of the wonderful things that are happening in our division,” says Hafso. As part of the healthy program for this year the schools will be reporting their progress by creating a video clip that will include the three priority areas on what the schools are working on. The video will then be submitted and posted on the schools website as well as BGHS’ site. Hafso says that BGHS will also be applying for a grant from the Alberta Healthy Schools Wellness fund, which is a comprised of the University of Alberta’s School of Public Health, Alberta Health and Alberta Education. BGHS has already received funding from the wellness fund in previous years and is hoping to receive more to help with their movement towards inspiring education and wellness being imbedded into the curriculum. “We are going to be supporting our teachers into moving forward in that area,” says Hafso. Superintendent Norman Yanitski, thanked Hafso and the committee for their hard work in promoting health and wellness in all of Black Gold’s schools over the years. “It’s not just food and exercise it’s also our social wellbeing and mental wellness, so it’s a very rounded wellness program,” says Yanitski. Teachers, parents and students can learn more tips and facts about healthy schools at BGHS’ site, which can be found by going to www.blackgold.ca and clicking on BGRS Healthy Schools on the left hand side under BGRS popular info links.